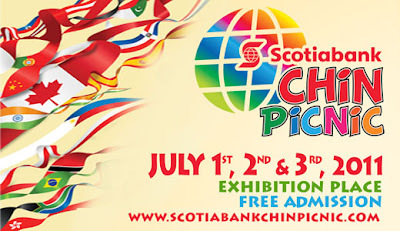 If you're looking for something to do with the family today why not check out the Caribbean Festival taking place on the Centennial Stage at the Chin Picnic. I happily remember this being an annual tradition with my family all through the 90's and I am so glad to see that this aspect of the Chin Picnic has returned. Enjoy!!! A full day of great Islands' entertainment! MCs Jai Ojah-Maharaj And Comedy Host Jean Paul. D'jango, Sattalites, Ossie Gurley and The Truth, Steele And Mountain Edge, Caribbean Folk Performers, Dance Caribe, DJ Enforcer and DJ Wuk Up. Headliners Half and Pint and David Rudder.